Do you ever get the urge to break into the Hamlet soliloquy you memorized in college? You know what they say, you either use it or you lose it and you can't let all those hours of rehearsing Hamlet go to waste! Use this Resin Cranium Prop to get into character once again. You will be prepared to break a leg when the imaginary curtains rise on your pretend opening night. Or, maybe Hamlet is not your thing and you skipped the play all together, opting for the movie instead, if so, you are not alone and we have all been there. 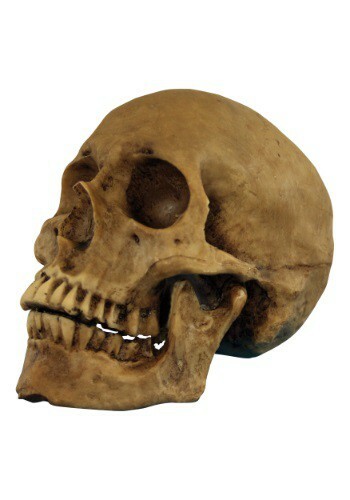 If that is the case, you can use this Cranium to add a realistic side to your Halloween decorations, spooky! Imagine if you pop this skull in your bathroom cabinet, and some unsuspecting guest to your Halloween party decides to snoop around… muhahaha. You can also choose to skip the prank all together, and make this Resin Cranium the center of your snack table centerpiece! You could even add a fun top hat if he needs to meet the costume requirement, he is pretty flexible, well, as flexible as a skull can be. The bottom line is, that this skull can be used for just about any Halloween decoration – even the random monologue – and he will add character to any room he resides in! His jaw is movable and he is discolored, to imply age – age also implies wisdom so maybe, if you are really in a pinch, you can ask him for advice, but if he starts talking (his jaw is hinged, after all), well, we are leaving the shovel in your graveyard on that one. But personally, we would catch the first broomstick out of there!